Comments: During the final days of the Clone Wars, Stass Allie leads clone troopers on the desert world of Saleucami. While patrolling on a speeder bike, Allie is struck down by clone troopers who receive Order 66, which directs them to treat all Jedi as a threat to the Republic. 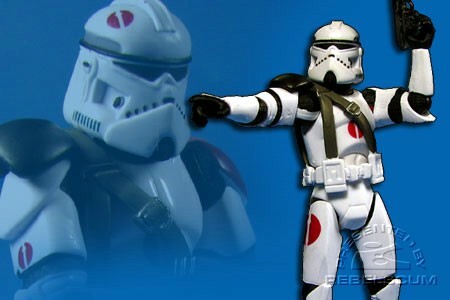 Saleucami Trooper is a "clean armor" version of the figure from 2007's TAC Treachery on Saleucami battle pack. This time around, the armor does not have any 'carbon scoring' marks. This figure contains an extra "Droid Factory" piece to Build-A-Droid. 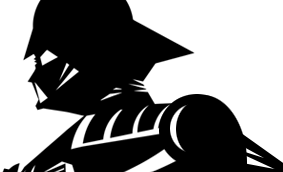 This figure includes 5D6-RA7's left leg. This figure has also been found in TLC wave 4, with the right leg of MB-RA-7. This figure has also been found in LC wave 9.5, with the head & middle leg of R3-M3.